Today is a very important day for Boroondara’s Chinese, Vietnamese and Korean communities – the beginning of the Lunar New Year, as we say goodbye to Year of the Dog and welcome Year of the Pig. Over the next 15 days or so, more than 1.5 billion people around the world will celebrate the occasion by spending time with family and friends, giving gifts and good wishes and feasting on foods with symbolic meanings. Joining in the festivities will be many Boroondara families, as more than 28,000 of our residents have Chinese, Vietnamese or Korean ancestry. Performers at the Kew Home of Chinese 2019 Lunar New Year celebrations. In late January I had the pleasure of attending Kew Home of Chinese for some early Lunar New Year’s celebrations, which was a wonderful opportunity to share in Boroondara’s cultural diversity. The atmosphere was joyful and festive as we were treated to traditional dance and Tai Chi performances, Chinese poetry and songs, followed by a magnificent shared lunch. Chatting with both the organisers and members, I was impressed with the impact this group has had on the lives of our Chinese community. For over 20 years it has been running programs and activities that help strengthen community bonds, promote health and wellbeing, and combat the risk of social isolation for its 300 plus members through English conversation classes, calligraphy and card games. 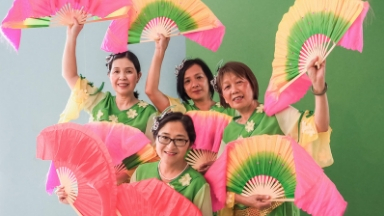 Community organisations like Kew Home of Chinese play an important role in bringing people from different backgrounds together, promoting cultural exchange and fostering understanding. It was a delight to be invited to their Lunar New Year celebrations and I could tell all the guests were having a brilliant time. I was also very pleased to learn that the 2019 Lunar Year is set to be a particularly auspicious one, because the pig attracts fortune and luck. So to all of you celebrating this week, I wish you a very happy and prosperous Year of the Pig!